of one of the most enchanting cities in the world. With Daniela and Cecilia you will be guided into this fun and convivial experience. HELLO! 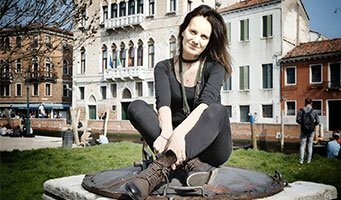 My name is Daniela, I am a licensed tour leader, a translator and an Italian language teacher. I have three passions: travelling, food (and wine of course!) and languages. I have travelled extensively around North and South America, Asia, Africa where I taught Italian and I lived and studied in London. I’ve learned that when travelling you only get to know a place for real, and have the most authentic experiences, when you follow your curiosity and go off the beaten path and spend time with locals observing how they enjoy life. That’s why with the help of Cecilia I founded TasteVenice when I moved here from Milan a few years ago. I wanted to offer experiences combining all of that: passion for authentic beauty, authentic food and authentic people. I will share with you the most genuine things that my beloved Venice can offer. The favourite thing to do in Venice? Sipping a glass of Prosecco sitting on table overlooking a canal at sunset. My favourite wine? Amarone! HELLO! My name is Cecilia, I am a professional sommelier and I am a licensed tour leader. I have several passions: wines, Italian and Venetian cuisine, meeting people and following my heart. While I was studying Economics and Art Management at Venice University, I decided to do something different with my life (do you remember? “follow your heart…”) and I started my study for the FISAR Sommelier Diploma. Since gaining the diploma, my passion for wine has been growing more and more intense and persistent. I’m not a chef or a food critic but I am passionate about food culture: I inherited from my grandmother a hand written little book full of her Venetian recipes and this is like a treasure for me. For me every journey is scattered with scents and it is connected to a bouquet of flavors: I don’t know how much time I spend sniffing herbs at the farmer’s market and thinking about the best wine to pair with. 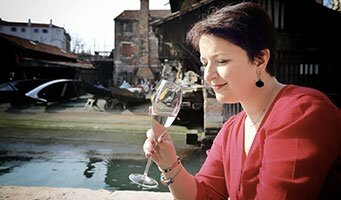 My business partner -no, I am wrong, my friend Daniela encouraged me to follow my heart and to express my personality: I think that wine is a pleasure and I love sharing this passion that I have in a relaxed and friendly atmosphere – and is there a more beautiful location than Venice to do this? I’m an enthusiastic supporter of aperitivo hour! I definitely love risotto! My favourite wine: Sagrantino di Montefalco. My name is Cecilia, I am a professional sommelier and I am a licensed tour leader. I have several passions: wines, Italian and Venetian cuisine, meeting people and following my heart. Get in touch to live an authentic Venetian Experience!